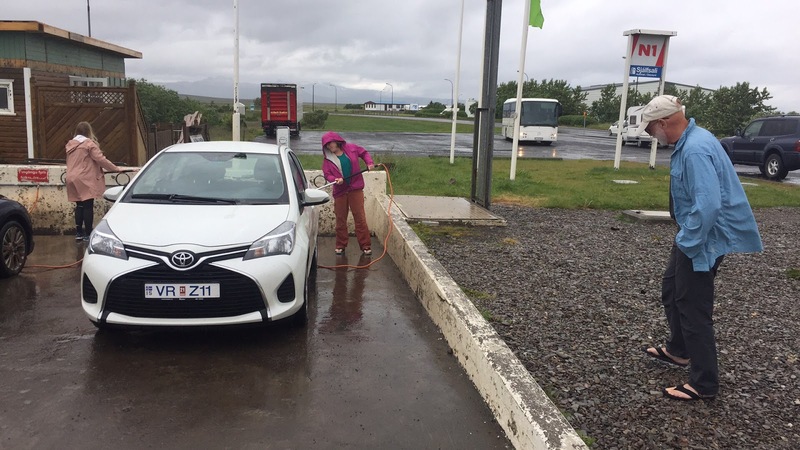 Becoming Nomads: Day 10 -Crazy High Mountain Road, WATERFALLS, and a Hot Spring! 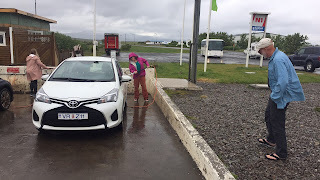 Day 10 -Crazy High Mountain Road, WATERFALLS, and a Hot Spring! As usual we were up early, enjoyed a provided breakfast of scrambled eggs, crepes and jam, and were off and running by 8AM. The drive was amplified by a long, winding, and very steep climb up a narrow, muddy, gravel road to the top of the first ridge line. A great way to start off the day. The weather had changed and from here on out it was mostly rain...except for...keep reading. From a distance we could see Dynjandi, one of Iceland's most famous waterfalls, and a protected national treasure. The closer we got, the bigger it got. To value the scope of it's size, zoom in on the people wandering the cliffs. From there it was up and down ridglelines and mountains, the gravel roads often offering up to a 15% grade, maybe the steepest we've ever driven. We spotted this African statue along the way and made a note to research it later on. The weather broke just in time for a visit to a hot spring along the shoreline. This proved to be a well-earned moment of relaxation as we soaked in the 100^ water....ahhhhhhh! The rest of our drive was pretty wet and muddy. The scenary was still spectcular. The lava reef fingers reaching way into the inlets proved to be a subject of much conversation. Near home we stopped to wash Zeleven. He was such a trooper, we decided he needed a bit of a bath. We arrived at our Iceland home in time for dinner and a well earned rest. Quite an exciting two days!